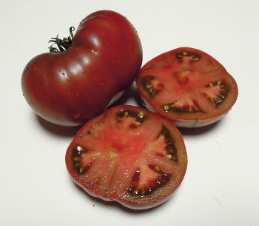 65 days from transplant – first offered to the public in 2014 by Heritage Seed Market, Knapp’s Seeds, and Tatiana’s TOMATObase. Boronia is a regular leaf dwarf variety that produces oblate medium fruit that ripen to dusky rose purple color. The flavor is well balanced, mild and sweet, and the variety is quite prolific. It originated from a cross made by Patrina Nuske Small between New Big Dwarf and Paul Robeson, named Happy. Boronia was selected and named by Patrina Nuske Small after a beautifully scented native Australian flower.